Solar swimming pool heaters should really be called solar swimming pool climate control, because they do more than just heat the swimming pool! In the spring, fall and early part of summer, when pool temperatures are often cool, solar swimming pool heating uses the power of the Sun to warm the swimming pool by drawing water out of the swimming pool, warming it up in solar coils by Heliocol, and then pumping it right back into your pool for your enjoyment. Plus, in hot summer months when the problem actually becomes that the pool water is too warm, a solar heater becomes pool climate control. At night, when it’s cooler, water is pulled out of the swimming pool, cooled off within the darkened coils, and then put back in the swimming pool. Truly climate control to modify the temperature of your swimming pool in all seasons! The outcome of buying a solar pool heating system is that Spring is no longer the time where you sit around waiting for your pool to warm up. Fall is just more time for swimming, not for pulling out your winter pool cover. And summer is when you enjoy ideal water temperatures, just as you and your family like it. For more information about how to have pool climate control with a Heliocol solar pool heating system, connect with Solaron in Lincoln at 916-631-9293. 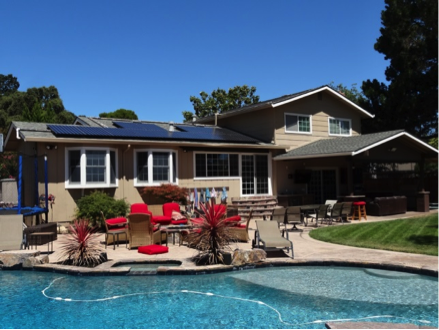 Our agents come to your household, study the landscape and the pool and offer a complimentary consultation for a solar pool heater installation. Trust Solaron for quality products in solar pool climate control! Solaron – using energy for life!